Crime Fiction, as its name suggests, is fiction about crimes, criminals, detectives and police. Included within this genre is legal thrillers and courtroom dramas. Mystery Fiction is closely akin to Crime Fiction and overlaps heavily with it, but focuses more exclusively on the puzzle element and logical solving of crime (i.e. the detecting of). Mystery Fiction can also include a far greater supernatural element than found in standard Crime Fiction. 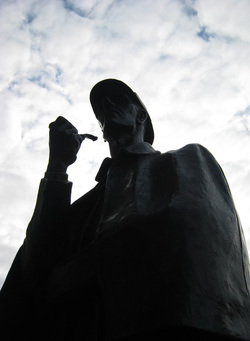 'Hound of the Baskervilles' by Arthur Conan Doyle, is a fantastic example of both genres. Bookmark this page if you want learn about the best crime fiction, detective novel or mystery novel. The terrible spectacle of the beast, the fog of the moor, the discovery of a body: this classic mystery novel pits detective against dog. When Sir Charles Baskerville is found dead on the wild Devon moorland with the footprints of a giant hound nearby, the blame is placed on a family curse. It is left to Sherlock Holmes and Doctor Watson to solve the mystery of the legend of the phantom hound before Sir Charles' heir comes to an equally gruesome end. THE HOUND OF THE BASKERVILLES gripped readers when it was first serialised and has continued to hold its place in the popular imagination. Agatha Christie's world-famous mystery novel, reissued with a striking new cover designed to appeal to the latest generation of Agatha Christie fans and book lovers. Ten strangers, apparently with little in common, are lured to an island mansion off the coast of Devon by the mysterious U.N.Owen. Over dinner, a record begins to play, and the voice of an unseen host accuses each person of hiding a guilty secret. That evening, former reckless driver Tony Marston is found murdered by a deadly dose of cyanide. The tension escalates as the survivors realise the killer is not only among them but is preparing to strike again! and again! Mike Hammer is the classic hard-bitten private detective. He talks hard, he fights hard and when it comes to love he falls fast and hard. Nothing at all is held back in this highly charged murder case that cuts straight to Hammer’s core. The tough, no-nonsense Hammer is faced with the cruel shooting murder of Jack Williams, a close friend, and takes it hard. In front of Pat Chambers, another good friend who just happens to be the Captain of Homicide, he vows that when he catches the murderer he would gladly shoot him in the gut, just like Williams had been. The case quickly becomes a race between Hammer and Chambers, as Hammer is determined to have his vengeance in this classic detective novel. When Carl Lee Hailey guns down the hoodlums who have raped his ten-year-old child, the people of Clanton see it as a crime of blood and call for his acquittal. But when extremists outside Clanton hear that a black man has killed two white men, they invade the town, determined to destroy anything and anyone that opposes their sense of justice. Jake Brigance has been hired to defend Hailey, in this classic crime novel. It's the kind of case that can make or break a young lawyer. But in the maelstrom of Clanton, it is also the kind of case that could get a young lawyer killed. Last night I dreamt I went to Manderley again ...Working as a lady's companion, the heroine of Rebecca learns her place. Life begins to look very bleak until, on a trip to the South of France, she meets Maxim de Winter, a handsome widower whose sudden proposal of marriage takes her by surprise. She accepts, but whisked from glamorous Monte Carlo to the ominous and brooding Manderley, the new Mrs de Winter finds Max a changed man. And the memory of his dead wife Rebecca is forever kept alive by the forbidding Mrs Danvers. This mystery novel is a complex and absorbing psychological chiller. Wine merchant Tony Beach is present at the annual party celebrating the success of the racing season when a runaway horsebox ploughs into the marquee, in this classic crime fiction. Witness to the terrible death and destruction, Tony believes it is a terrible accident until he becomes involved in the investigation. THE MALTESE FALCON (1930) set the standard by which the private eye sub genre of the detective novel genre is judged. Sam Spade is hired by the fragrant Miss Wonderley to track down her sister, who has eloped with a louse called Floyd Thursby. But Miss Wonderley is in fact the beautiful and treacherous Brigid O'Shaughnessy, and when Spade's partner Miles Archer is shot while on Thursby's trail, Spade finds himself both hunter and hunted: can he track down the jewel-encrusted bird, a treasure worth killing for, before the Fat Man finds him? The Moonstone, a priceless yellow diamond, is looted from an Indian temple and maliciously bequeathed to Rachel Verinder. On her eighteenth birthday, her friend and suitor Franklin Blake brings the gift to her. That very night, it is stolen again. No one is above suspicion, as the idiosyncratic Sergeant Cuff and the Franklin piece together a puzzling series of events as mystifying as an opium dream and as deceptive as the nearby Shivering Sand. T. S. Eliot famously described THE MOONSTONE as 'the first, the longest and the best of modern English detective novels'. Who is killing monks in a great medieval abbey famed for its library - and why? Brother William of Baskerville is sent to find out, taking with him the assistant who later tells the tale of his investigations. Eco's celebrated story combines elements of detective novel, mystery novel, metaphysical thriller, post-modernist puzzle and historical novel in one of the few twentieth-century books which can be described as genuinely unique.